Newspread is a gorgeous WordPress theme designed especially for blogging and writing. Newspread is an ultra fast loading, Magazine/News WordPress theme designed to give you the best platform for modern content focused websites. 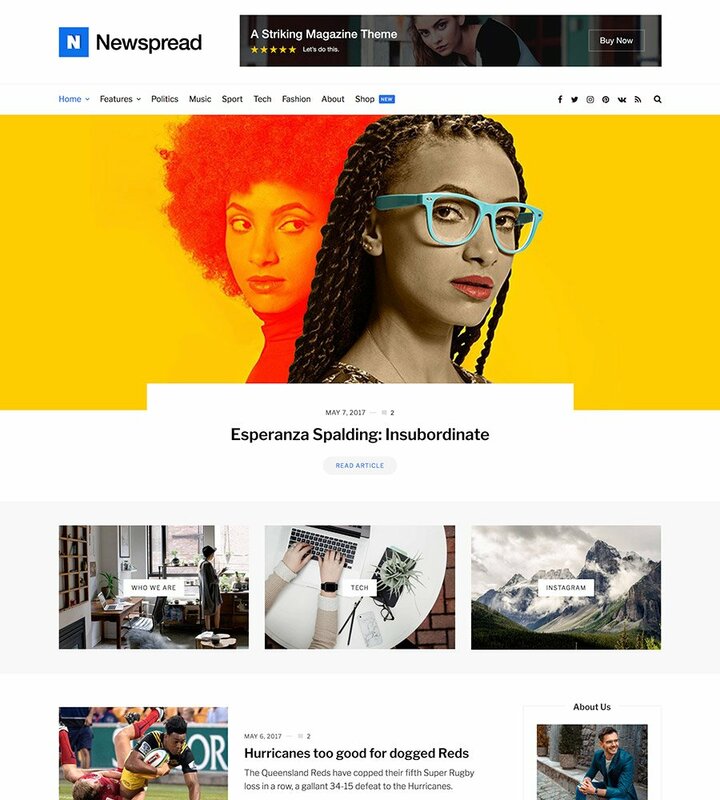 Whether it’s a personal blog, a newspaper, the next Buzzfeed, The Verge or the next Business Insider, Newspread is the perfect WordPress theme to drive your success. With gorgeous typography, a clean, defined look which works with any kind of content it’s easy to showcase your articles and blog posts for the world to see. Whether you are an established content site or on the brink of a new idea, you’ll be able to create a striking online publication with Newspread. Best of all, everything is mobile-ready right from the start. We’ve spent a huge amount of time ensuring that’s it’s also fast loading – speed is essential for a theme like this. Your articles will look fantastic in our elegantly designed grid-based Newspread WordPress theme. It includes an option to have a ‘sticky’ advertising banner in the sidebar so that it is always in view. Start selling right away with WooCommerce integration. With over 10 million downloads WooCommerce powers 30% of online stores. It’s the fastest growing platform in the world and the perfect solution to start selling. As WooCommerce experts we’ve taken great care to ensure Newspread has better WooCommerce support than your average WordPress theme. Focus on writing great content and our theme will do the rest. Brilliantly SEO optimized and lightweight, it’s a great choice. The theme is absolutely perfect for my current use. Each section is easy to configure via the customize tab and the content is displayed clearly throughout. Another added bonus is that this theme is focused on achieving a fast loading speed, which Google loves - thank you to the developers of this theme.